On the Sunday before we left Helsinki, Chris and I took a boat trip to Suomenlinna Island, which is a short 15-minute ferry ride off the main harbor of Helsinki. The island has functioned in a number of ways over the centuries, most notably as a military fortress and most recently as a residential neighborhood/tourist trap. The day we went was chilly but calm and we walked all over the island, exploring the oddities and beautiful views. 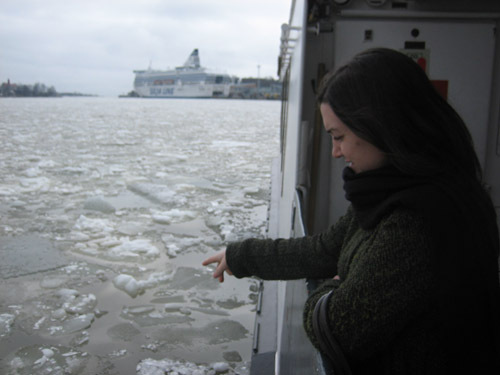 There was still a lot of ice near the shores that scraped the bottom of the ferry as we passed over it. Good thing we were close enough to the shore that if there happened to be a Titanic reenactment, we wouldn't be too far away from rescue. But I would totally want to play the part of The Unsinkable Molly Brown. Chris and I had the opportunity to go with some of his colleagues to a “Festival of Electronic Arts and Subcultures” in Helsinki, Finland at the beginning of April. I have never before been a part of a festival of subcultures before. According to the dictionary, a subculture is “One culture of microorganisms derived from another.” There MAY have been other definitions, but I am choosing to use this one. 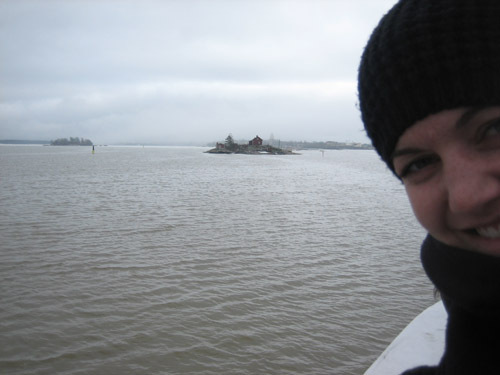 There were definitely lots of microorganisms floating around in the brisk Finnish air during that week. Microorganisms armed with dreadlocks, MacBooks and thousands of electrical cords. I was almost swallowed up by one particularly tangled mass of cords near an exhibit. However, since I am not actually an electronic artist, nor am I part of some sub-group of microorganisms, I was able to do a little sightseeing around the city. Helsinki has a strangely familiar feeling in the air to Minneapolis. Granted, they look nothing alike, but the sky and the smell of it made me feel at home. 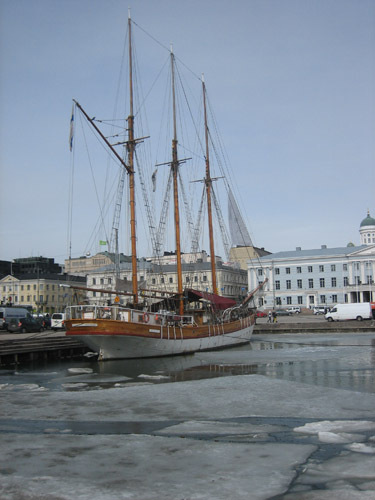 The Helsinki harbor was beautifully fresh and still filled with ice chunks floating in the water.